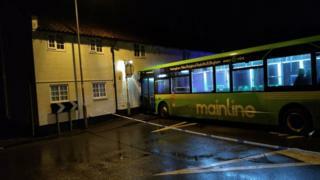 A man has been banned from driving and ordered to pay compensation after a crash led to a bus hitting a house. Brett Woodhouse of Loughborough Road, West Bridgford, was at the wheel of a car that collided with the Trent Barton bus before it then hit the house. The 18-year-old admitted driving while uninsured and without the correct licence following the crash in Radcliffe-on-Trent on 26 January. About 15 people were on board the bus at the time and one woman was injured. Woodhouse was banned for 12 months, given a 100 hour community order and told to pay £300 compensation to the injured woman. At Nottingham Magistrates' Court, he also pleaded guilty to failing to stop for police before and after the crash.